This suspenseful novel contains a subtle message about how power could be used for good. 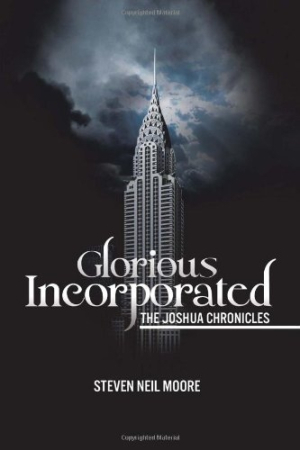 In Glorious Incorporated: The Joshua Chronicles, by Steven Neil Moore, what starts as a corporate recruiting competition for the services of a young business executive (and a battle for his soul), sets off a chain of events that results in a worldwide struggle for the hearts and minds of humankind. Coming at a juncture when corporate responsibility and greed play a major role in public discourse, this is a timely work of fiction from a new author and should be well received by readers who fall on the more-responsibility/less-greed side of the debate. The story opens as earnest, forthright Joshua Arden is on his way to an interview at the monolithic and domineering Alastar-McGlocklin, the largest securities and acquisitions firm in the world. But a question plagues his mind: “What do you think about the fate of the world?” It’s a question that was posed to him at a similar meeting at Alastar-McGlocklin’s chief rival, the smaller and more ethical Jonah International, and it inexorably alters his path. Ultimately, Joshua rejects the job, but in the process meets people who will play major roles in a global power struggle. Joshua chooses (or is destined?) to work for Jonah International, and the die is cast. Glorious Incorporated stretches from prehistory to futuristic boardrooms and from the Vatican to a cabin in the darkened woods where Joshua Arden, and he alone, will witness a global war played out in nanoseconds. The reader sees glimpses of Joshua’s increasing interest in social justice, which builds into a crusade as he calls a flock of followers to his cause from among the formerly wicked or duped participants in a system that denied choice. Individual choice is the centerpiece of Arden’s (and Jonah International’s) agenda for the salvation of all. As the metaphor of good over evil plays out, it becomes a refreshing prism through which to view a tale of corporate espionage. Glorious Incorporated reads as a sort of a photo negative of Ayn Rand’s Atlas Shrugged, though, thankfully, not nearly as long. It demonstrates, to Moore’s credit, fluidity of plotting, organic character growth, and a subtle, not often heard message about how power can be used for good. His dialogue rings true and it would be hard to find a single wasted sentence. This work has a crafted feel without the sense of an author sticking laboriously to an outline, moving from Point A to B like a well-oiled machine. Some poignant flashbacks to Arden’s blighted childhood give an extra layer of credence to the idea that fate has shaped his life and that he will be at the forefront of shaping a new, hopefully better, kind of world. Though Moore is unabashedly new to writing—the book’s cover, with its rather bland artwork, notes this is his first “fictional novel”—he appears to be on a successful trajectory; and he has a sequel in the works. Glorious Incorporated: The Joshua Chronicles takes sides in an ongoing international debate, and it will likely be best received by readers who share the author’s viewpoint. But in the abstract, it’s a good read with strong characters and a tight story line, blending elements of suspense and fantasy, and it may garner its author some fans as well as philosophical converts.